Earlier this month, only a couple days after moving into our new place near Christie & St. Clair, I went to Spicy & Sweet Chinese Restaurant for a late lunch. I was looking forward to having a Chinese restaurant so close to home! A man and woman, presumably the owners, were seated at a table near the back finishing up their lunch when I arrived. I seated myself at a table near the middle of the restaurant and was brought the lunch menu right away. I guess everyone just orders their lunch specials? I had to ask for the regular menu, which I wanted to see mostly out of curiosity. But I went ahead and ordered their Lunch Special, Combo A for $6.99 (Fried Noodles, Spring Roll and Daily Soup) as well as a Heineken for $4.95. Being the only customer in the restaurant, my beer didn’t take very long to make it to the table, but the accompanying beer glass was very dirty and grimy on the outside. Not a great first impression. 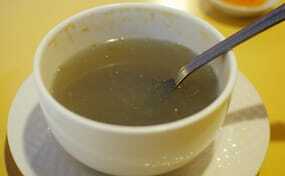 The broth for the Egg Drop Soup was very grey and had lots of scum floating on the top and sticking to the sides of the bowl. 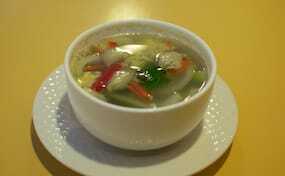 It tasted watered down and quite bland, but the vegetables were crunchy and fresh. A very crispy, piping hot Spring Roll was next to arrive, and though the oil used to fry it was definitely clean and fresh, the filling tasted like it was a couple days old and like the cabbage inside was starting to go bad. Hungry as I was, I ate it anyways, but it wasn’t pleasant at all. 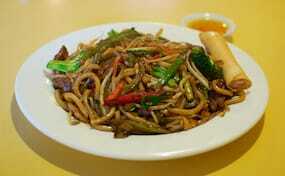 The Shanghai Noodles with Beef arrived slathered in soy sauce and with an abundance of bean sprouts filling it out. Far below average, even below what you’d get from a food court. 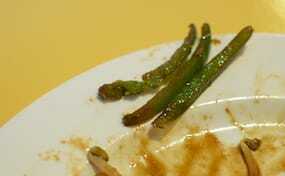 The broccoli was not overcooked though, and noticeably fresh – a sharp contrast to everything else in the dish. The beef was also super tender, so tender in fact that I started to question whether it was really beef or not… But easily the worst part of the dish was the smell of the rotted green peppers – you can see from the photo that the tips were all mushy and brown. 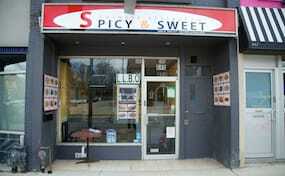 Everything I had at Spicy & Sweet Chinese Restaurant tasted like it was on its way to being spoiled. I got a pretty bad stomach ache before I even finished. Why, oh why did I eat this food anyways, instead of complaining? 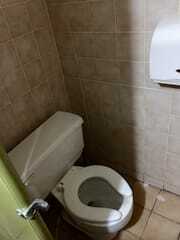 The bathroom, located in the basement, was very dark and smelly. 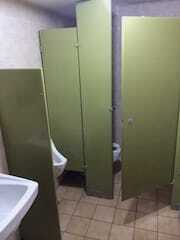 The toilet was clean, but the stall was especially dark with the door closed. If I didn’t have such a bad stomach ache, I probably would have waited until I got home, but I just did what I needed to do and quickly got out of there as fast as I could. Not a very inviting bathroom by any means, especially with that smell. Shortly after I got back to my table to finish my beer, the waitress came to tell me that in fifteen minutes they were going to close so that they could have a lunch break. So basically, please GTFO in fifteen minutes or less! Terrible! I left my beer more than half-unfinished, paid my bill and left feeling rushed out the door. But sure enough, they locked the door behind me and changed their sign to "closed". According to my bill, I was only their fifth customer of the day, which includes take-out orders. You’d think they would have encouraged me to stay longer and perhaps order another beer, no? And when I got there, I saw they were already finishing their lunch so why did they need another lunch break? 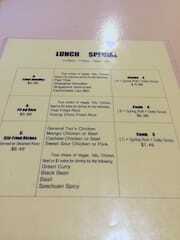 I also noticed when I got home that their lunch menu states that the special is available from 12:00pm to 3:30pm. Why were they closing their doors before 3pm then? Needless to say, it didn’t inspire me to want to return, but given the abomination of a meal I just had, that was already a given anyways. 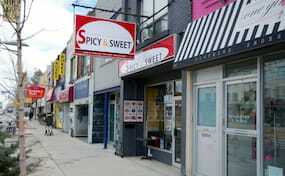 While writing up this review and searching for the DineSafe ID for Spicy & Sweet, I found out that the restaurant was closed in August 2013 and fined $2500 for inadequate pest control and "failing to prevent gross unsanitary conditions". Doesn’t surprise me. 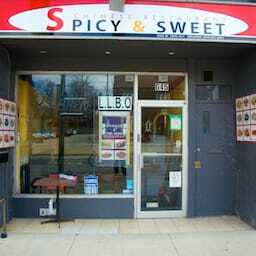 Spicy & Sweet Chinese Restaurant was published on Wednesday, April 23, 2014 at 2:00pm EDT by Daniel Menjívar and last updated on April 11, 2018 at 9:30pm UTC .